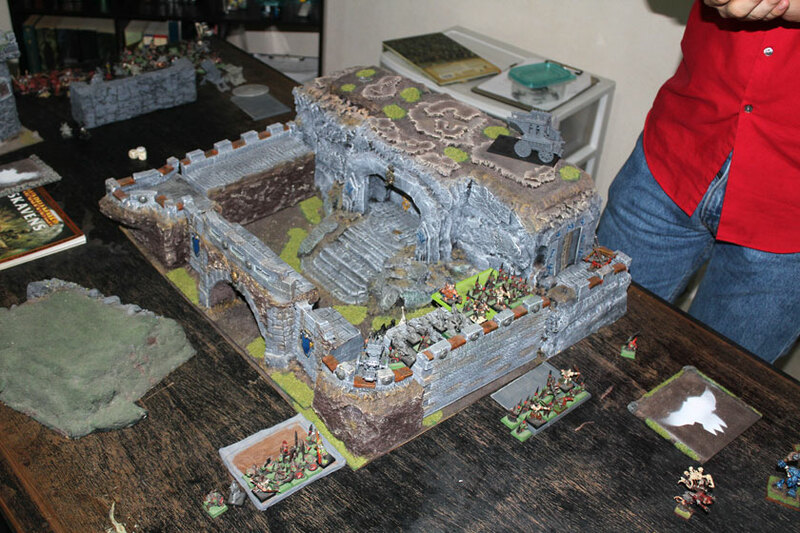 About two weeks ago I had a pleasure to meet the guys from Warhammer Fantasy Battle Club in Tuxtla Gutiérrez, Mexico. Read all about it here. 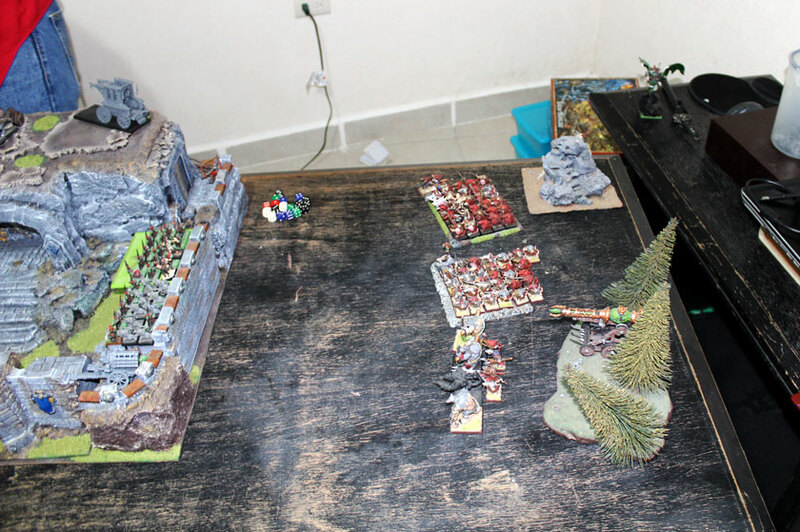 Warhammer Fantasy Club in Tuxtla Guiterrez. …but what most important – we played awesome battle, and now, as I promised I’m giving you right now the very first battle report on Game of Travel! 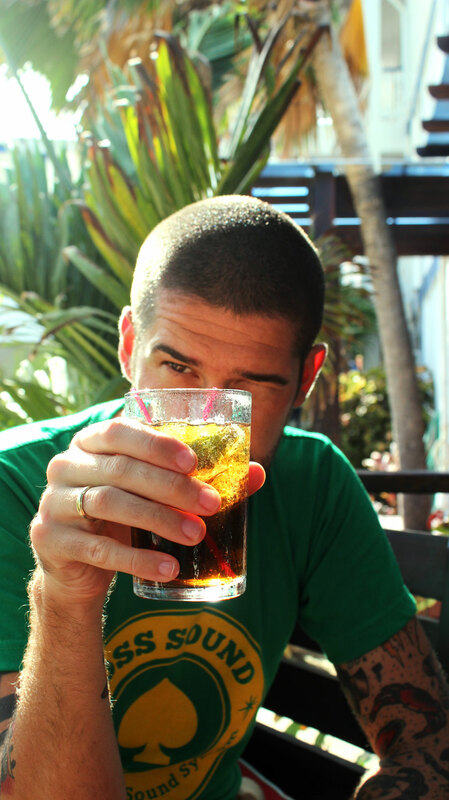 (too bad I couldn’t posted earlier, but for last week I was super busy…having vacations with my wife in Belize. No working, painting or writing – only free time:). use of proxies. Lot’s of the have been used – I don’t like proxies and I don’t use them in my armies – I try to avoid them at any cost – for me, WYSIWYG is almost the sacred rule. If the model has shield and the axe – so in the army list he has the same. Simple as that. Apparently in Chiapas, they don’t care about that rule that much. 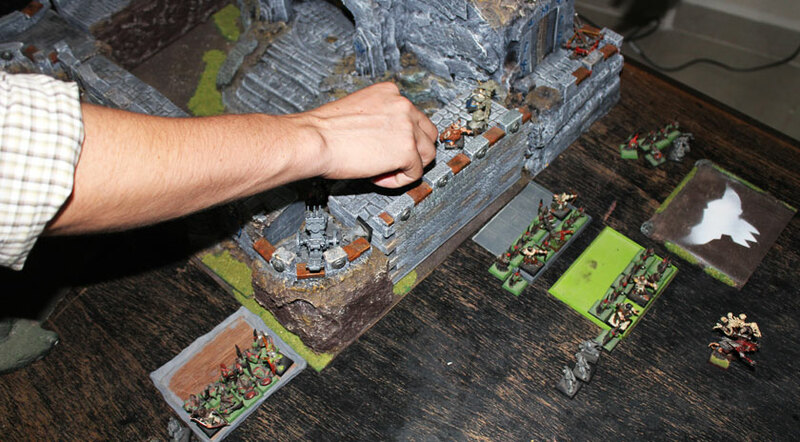 So, if they want to put Goblin Spear Chukka (or 3:), they do that if even they don’t have any models… I couldn’t object – I was the guest in the club – if they play like that – ok. Too bad, but ok. (few unnecessary proxies were used in the battle that day, IMHO). and at last, we played Siege scenario, with some kind of unclear home-made rules. I didn’t want to use such rules for battle report, to avoid any confusion. Whole story was all about ancient Dwarf Stronghold, which was not so Dwarfish any more. It fact, it was as green as possible these days – Goblins, sneaky little buggers, took over it few decades ago. Sad and dark part in Dwarfs chronicles – as you probably suspect, it was only matter of time that young and brave Thane and his army will make an attempt to get rid of green plague from the homeplace of his ancestors. 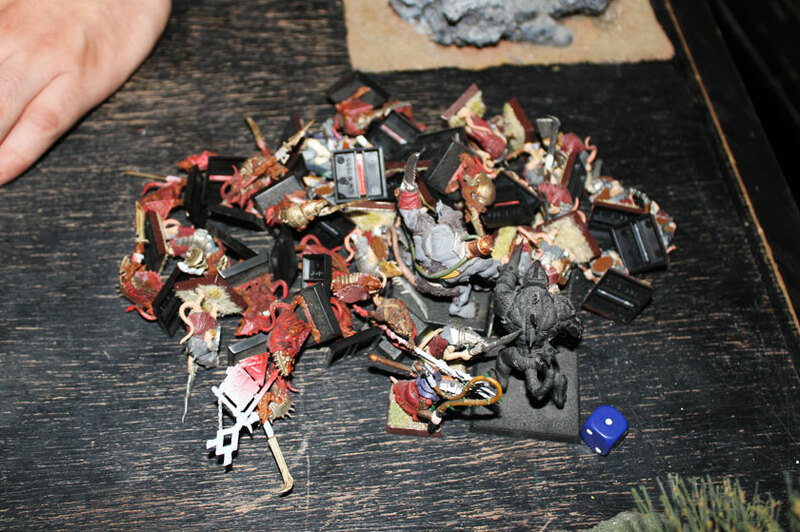 Dwarf Army (1000 points) – controlled by Eduardo, our host from Warhammer Fantasy Club Chiapas. Dwarfs ready for battle. From the bottom: Longbeards, Flamethrower, 2 Cannons and Warriors. All deployed on the west of the stronghold. 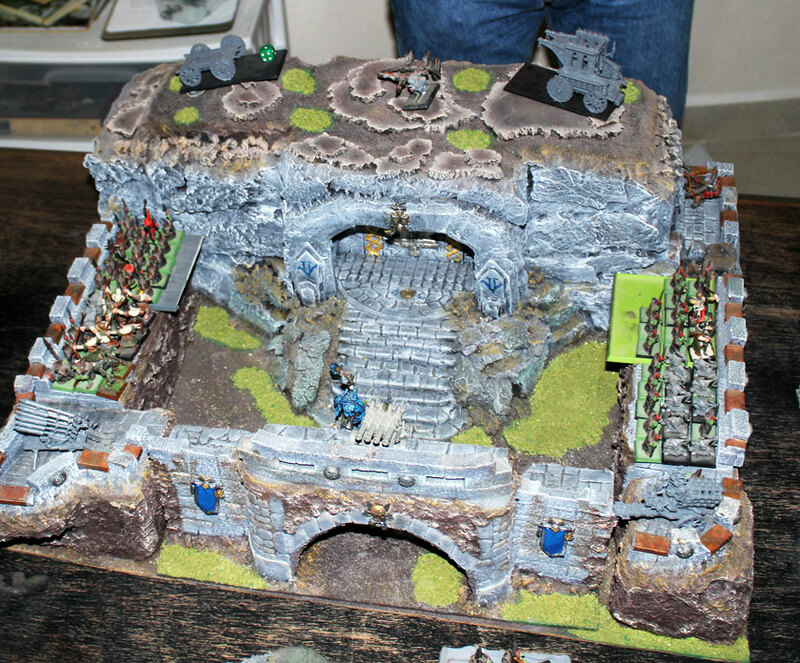 Dwarfs were attacking the fortress from the west. The moment was perfect – Goblin forces were not that strong that day, so Dwarf Thane thought – this cold be the day! He couldn’t be more wrong. Goblins were ready for any attack. 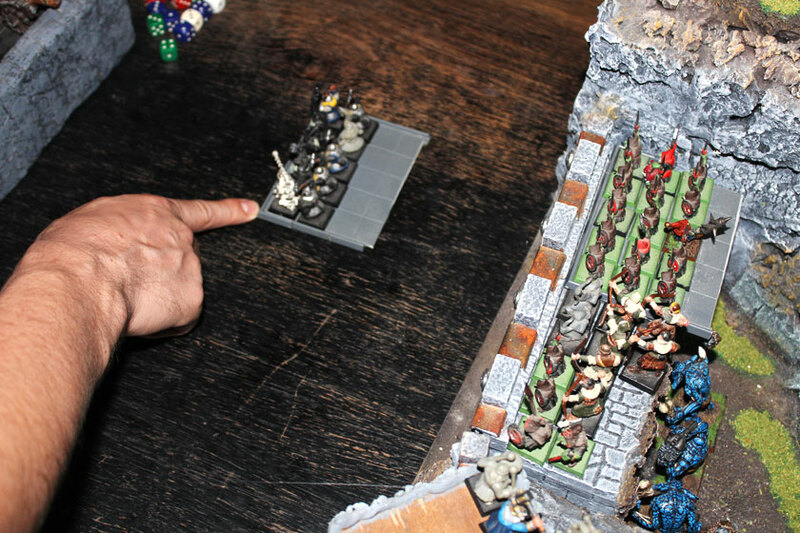 In fact, Dwarfs stood no chance against hordes of Goblins holding the keep. It should end miserable for foolish Thane and his company. 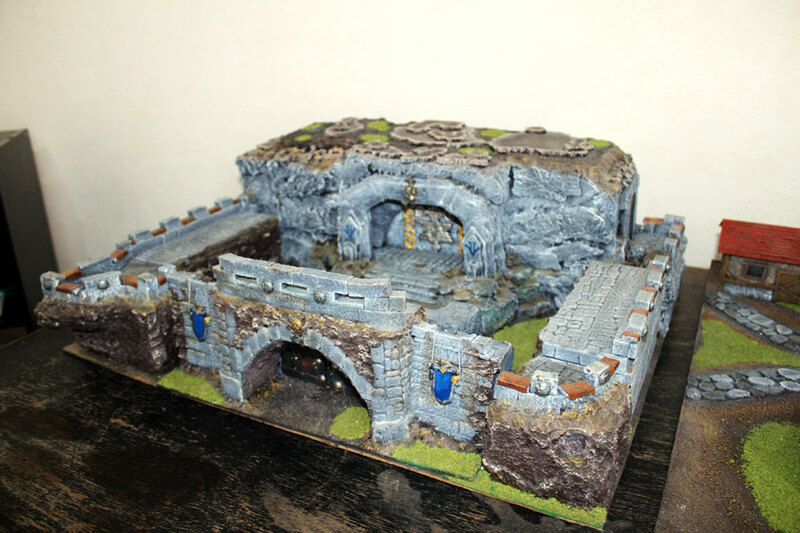 Goblin Stronghold Defenders (1000 points) – Victor had this side. 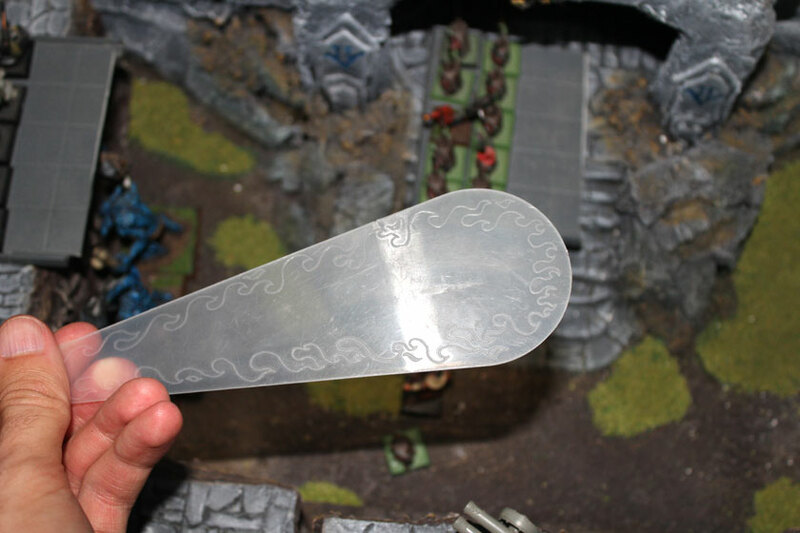 He is regular Warhammer 40k player and for him, it was the first game of WHFB. There was one thing – both Dwarfs and Greenskins haven’t thought about. 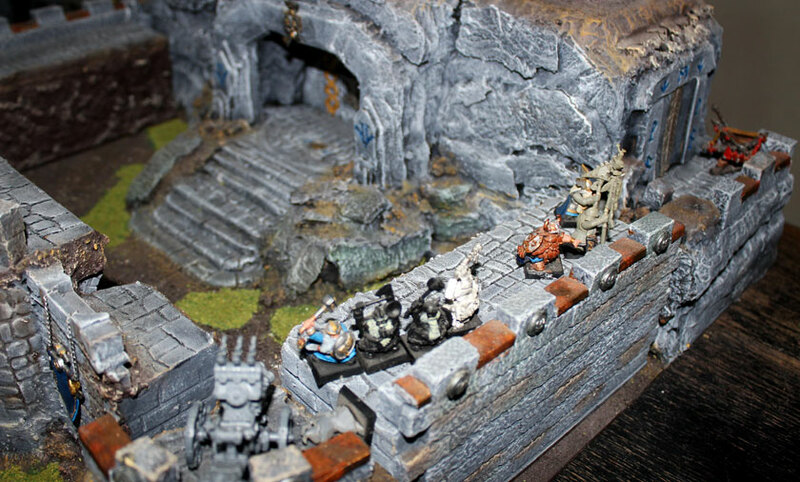 The third party was also very interested of taking the fort – Grey Seer Quiksqeek. Rumors were, the Dwarf fortress is full of unspeakable treasures – Goblins are weak – they are no match for Quicsqueek and his mighty Skavens. It is just formality to take the fort and all of gold, gems and magic items inside! Skaven Attackers (1000 points). I took the control of Skaven horde! Finally! Skaven Army from the east. From the bottom: Warp Lighting Cannon in the woods, Rat Ogres, Slaves with Warlock Zzapvolt and Clanrats with Grey Seer Quiksqueek and Chieftain Raddrish The Last (and Ratling Gun). Skavens were attacking from the east, taking Goblins inside by surprise. That was totally unexpected! The gamechanger – Dwarfs from the west – OK. Piece of cake, but Skavens in the same time from the east! Where the bloody vermins came from? And coincidently in the same time…? Future wasn’t so bright and clear after all – Goblins were forced to divide their regiments on two sides, making the defend more difficult task, than they thought it will be. only one rank of besieging unit can made attacks. Meanwhile, Dwarf artillery started causing mayhem among Greenskins. Flame thrower released the fire into one of The Goblin units. One third of them were burn alive and survivors couldn’t stood the sight of burning fellow Gobbos and they ran away screaming in panic. Greenskins are burning! Flame Thrower Crew made their job perfectly. Skaven advanced! 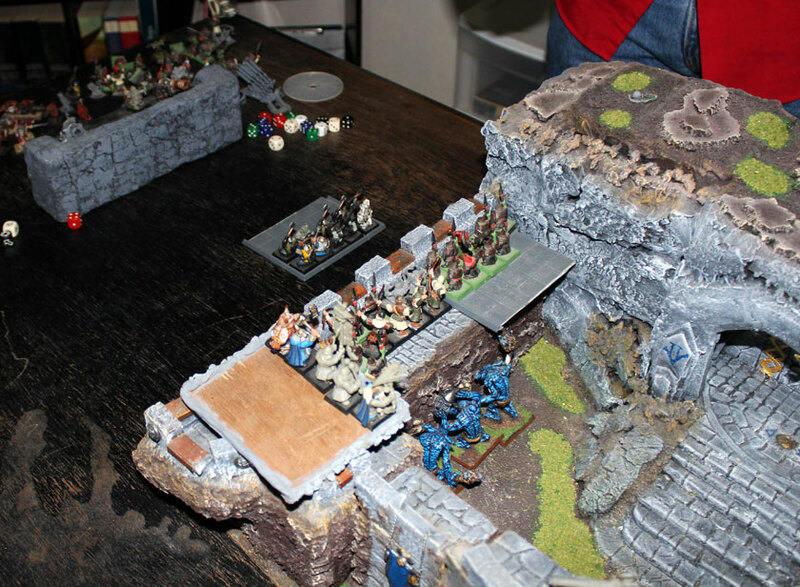 Rat Ogres charged right away (they were so close to the wall! ), Slaves marched forward, Clanrats stand their ground waiting for Grey Seer release his wicked spells and Ratling Gun shoot its barrel of lead. That’s when the misery has begun. Winds of Magic weren’t specially lucky for Grey Seer (only 5 on the power dice). For real?! This is not acceptable! I need more power – shouted Quiksqueek and released the power from Forbidden Rod. Almost clever deed. Unfortunately the power generated from The Rod overcharged the poor Skaven wizard killing him instantly. Basicly, that was over of Skaven siege. Without of might and destructive support of Grey Seer’s spells, Skavens had very little chance to take the stronghold, not to mentioning to defeat Dwarfs. …but they tried to go on…Stubborn rats! Warlock in his despair casted Death Frenzy Spell on the slaves, One turn too early, if you ask me… (6 of them died due of increased metabolism – no need to weep after slaves. After all, they are only slaves:). Ratling Gun exploded at first shot. Warp Lighting Cannon misfired, without any drastic repercussions (uff..), but shooting phase were almost unfortunate as magic phase. 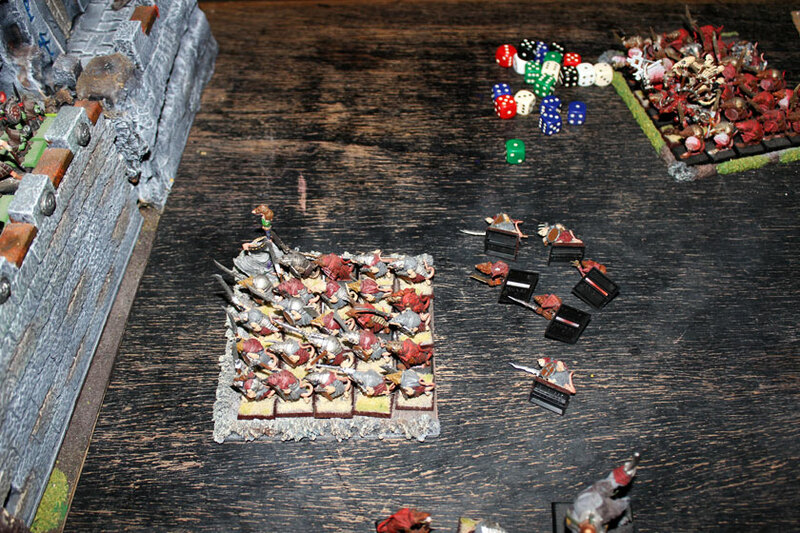 Lucky for Skavens, Rat Ogres got into combat! …but their charge weren’t that fruitful as should be. 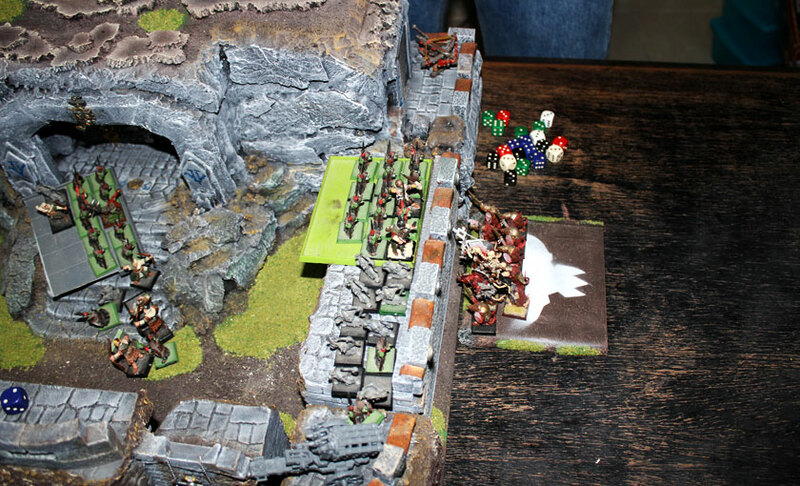 During attack 2 Rat Ogres were killed by sneaky freaky goblin arrows (stand and shoot), but remaining two (including super mutated Master Bred Rat) climbed on the wall to kill green weaklings! And only two Goblin heads were smashed! What a pity! 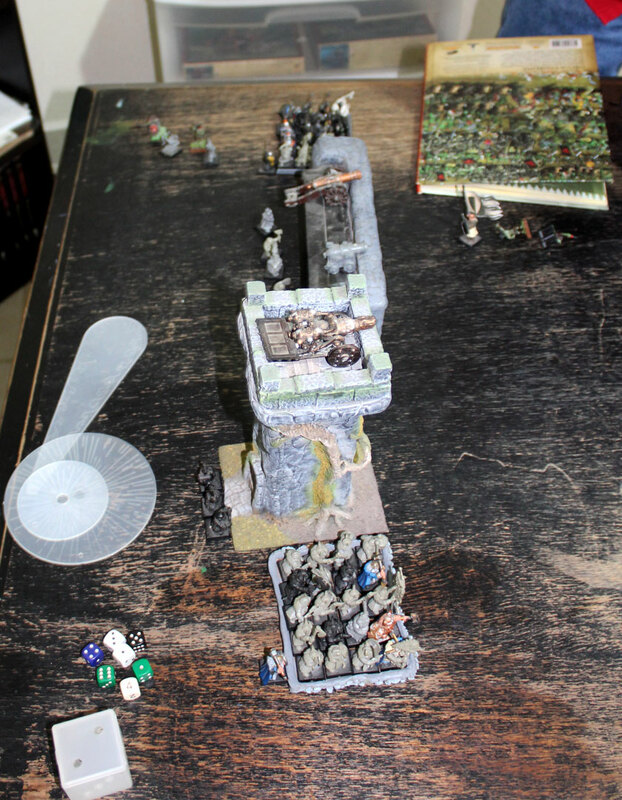 That was not enough to stand in combat – pack masters didn’t hold their nerve and the fell back together with Rat Ogres from the combat as fast as possible (Horned Rat were not on my side this miserable day…). 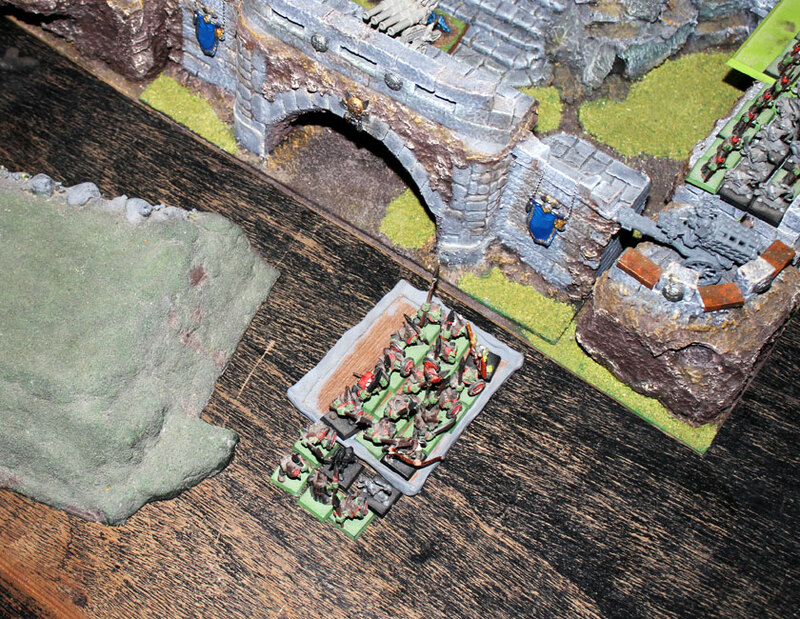 Panicking Goblin unit managed to hold the grip and rallied, Trolls got stupid and did nothing, and rest of Goblins prepared themselves to shot to whatever is outside walls. Goblin Archers rally! Time to shoot! Spear Chukka hit and killed 5 Skaven Slaves, Rock Lobber direct hit Clanrats and smashed 10 of them. 8 more slaves fell from the goblin arrows. On the western flank – all available shooting power concentrated on marching Longbeards – Doom Diver, Spear Chukkas, Archers. All together managed to kill 14 of them! That was definitely lucky shooting for Goblins! Some Longbeards have been shot too. Dwarf Warriors at this point were close enough to charge the walls. They hoped to get those incredibly lucky archers – in close combat they will not be so effective (hopefully:). 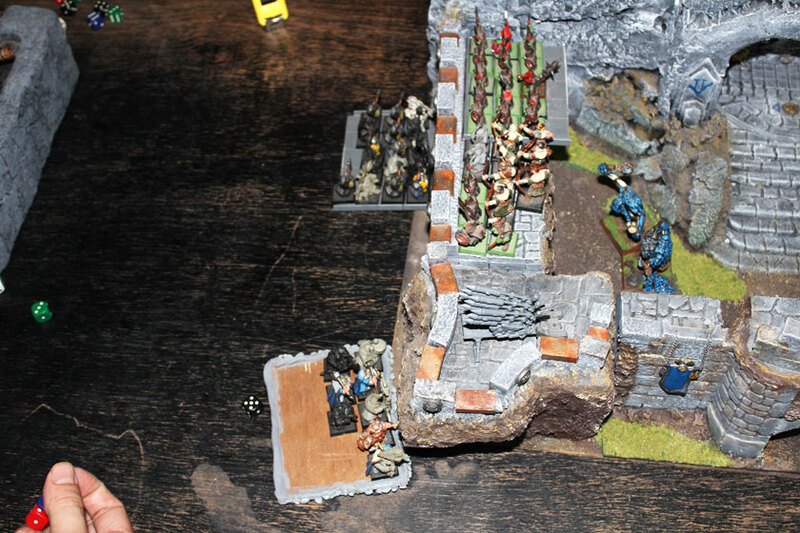 The hopes were futile – three Warriors died because of Goblin Stand & Shoot, and only one Goblin were killed in combat, so the defenders didn’t allow any of besieging dwarfs to climb on the wall. Warriors charge Archers and Longbeards Spear Chukka. In the same time remaining few Longbeards climbed the tower to get to the crew of Spear Chukka. They killed all the crewmen and triumphantly took the tower! Flame Thrower continued to put Goblin on fire. 5 of them died horribly, but this time the regiment probably got used to sight of burn, and they held still. 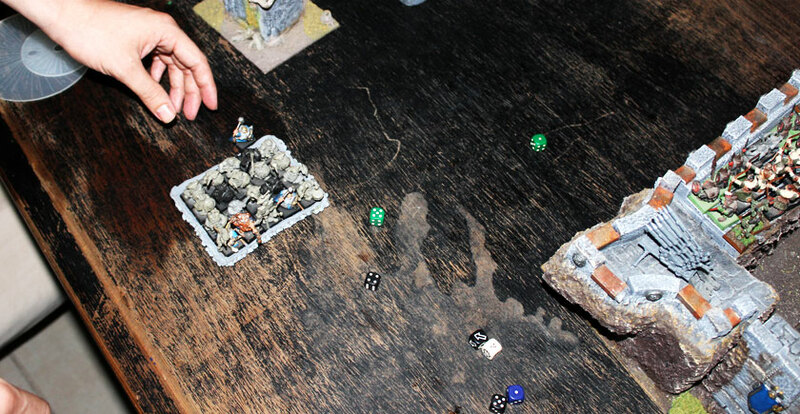 First Dwarf Cannon hit Rock Lobber – destroying it instantly, and second did the same with Goblin Doom Diver. Much, much better shooting from Dwarfs than the last time. Good work fellows! Stupid Slaves, even with their frenzy didn’t kill even one damn Gobbo! In return, Goblins killed only 3, but it was enough to lose the combat horribly – no save for slaves and Warlock Zzaplvolt who recklessly joined the regiment – they kill themselves while attempt to flee. That was expected – slaves always fail. Weak Slaves fail as always! 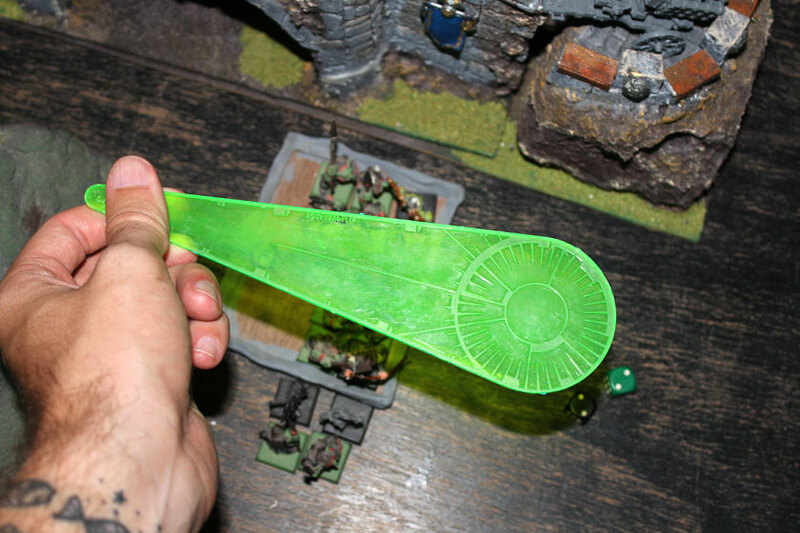 Warp Lighting Cannon missed to hit Goblin Spear Chukka. Again, useless. Obvious Clan Skryre treachery! 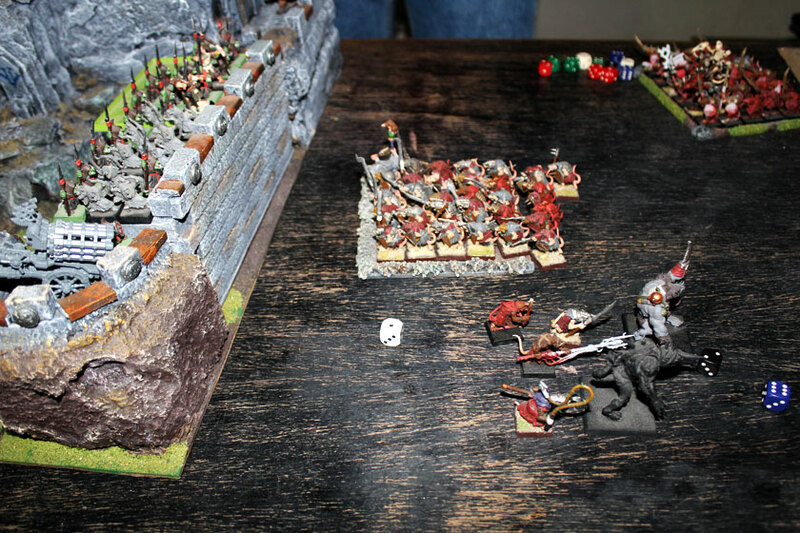 Goblins continued to shoot the eastern flank – archers try to kill as many advancing Clanrats as possible, before they can jump on the wall. This time Horned Rat was gracious. Only one Skaven was killed. Uff..
On the west, Dwarf Warriors got struck with big shoulder of the Rock Lobber. 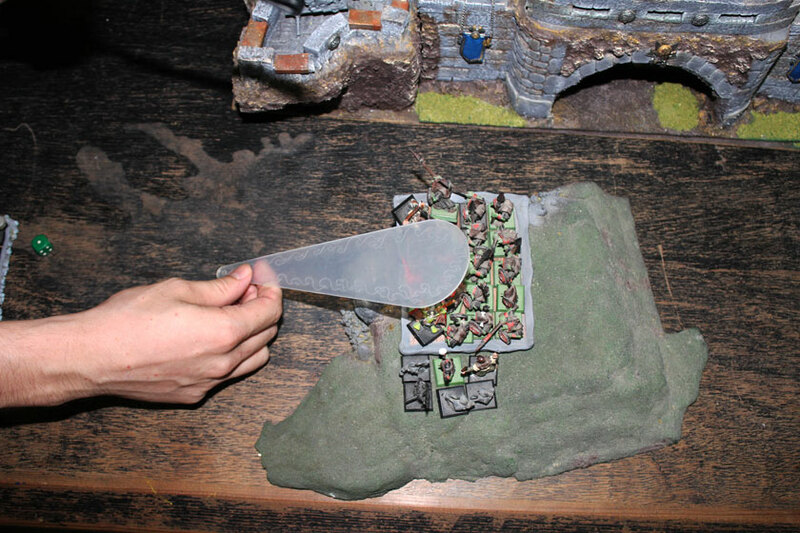 The Goblins had good eye on this – even the Dwarfs were climbing the ladders, even they were so close to Goblin archers – the rock smashed 4 of the warriors – and no Goblin got harmed. Yay, for Rock Lobber! The very few of remaining Longbeards got hit again by Spear Chukka. 2 killed – only 5 left including Thane. Dwarfs needed to hurry, if they wanted to retake the stronghold. Their numbers were getting drasticly low. Meanwhile, Dwarf Clan Warriors were driven off the walls by Goblin Archers. No surprise, poor Dwarfs didn’t kill even one Greenskin. Kill! Kill them! The keep is ourz! – cheered Big Boss Grotbin. The Trolls inside the castle remained stupid – did nothing. Clan Warriors snapped out of lack of courage and rallied themselves, and Longbeards charged archers from the left flank. Both Cannons and Flame Thrower haven’t done any damage this time (big disappointment among Dwarfs – they have failed in the area they should be the best…). Longbeards though, took the bloody revenge on Archers, that chased away Dwarf Warriors. They killed 7 of the Goblins and forced them to flee. The western wall was clear of Goblin disease at last! Longbeards made successful charge at Archers flank, and Warriors rallied. You can also see Trolls got stupid in the yard. It’s impossible to rely on Clan Moulder either. 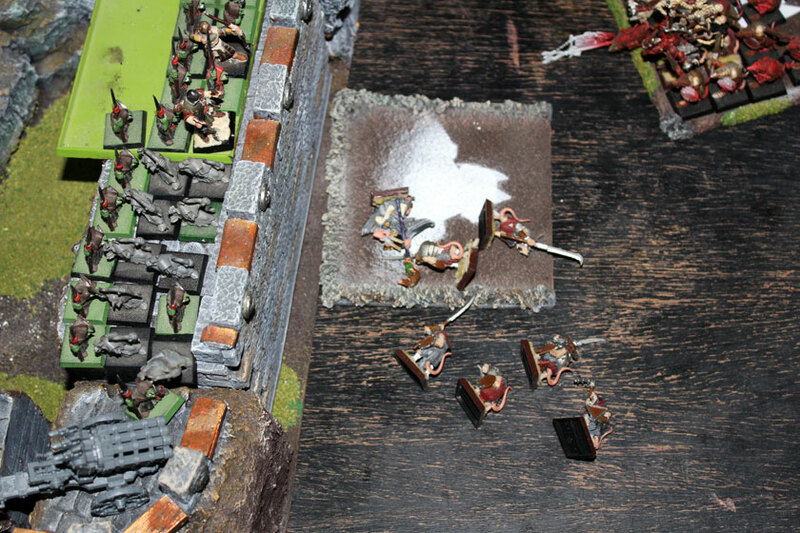 Rat Ogres simply ran off the battlefield..
Who remained? 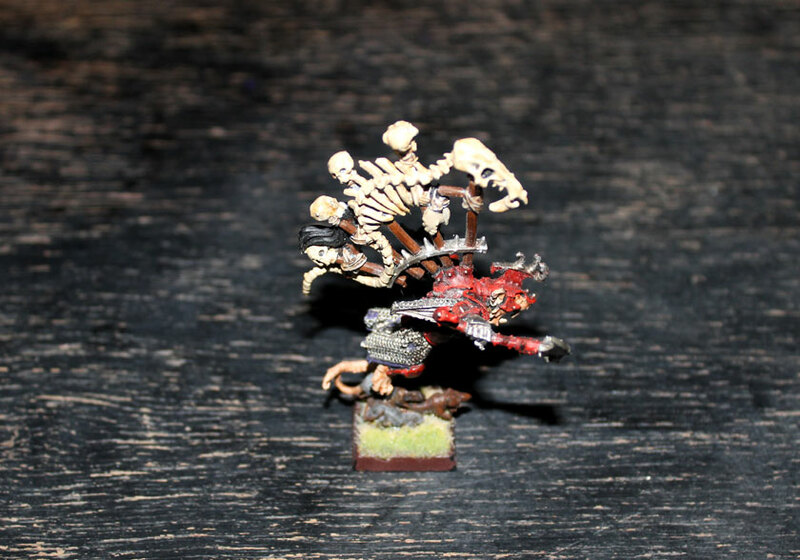 Only unit of Clanrats with Battle Standard Bearer Raddrish The Last (how accurate name!) and so far, totally useless Warp Lighting Cannon (to be fair, this time the lighting killed 6 Goblin Archers – it’s little bit to late for that – the result of the siege was overdone). Trolls finally were able to do something – they quickly move toward Longbeards. Fleeing Goblins on inside castle yard rallied. Remaining Rock Lobber tried to hit one of the cannons. Nothing. Two of Spear Chukkas concentrated their fire on Longbeards (or more like – on one last Longbeard and Thane and Runesmith). Eastern side. The remaining Skavens got the feeling, they actually could make some impact here. The Goblins are weak, no need to be afraid. Die-die, green-things! Flame Thrower was very efficient in this battle. More Gobbos ran way from flames. Imagine your comrades burning in liquid fiery… no wonder those Goblins were running away from the trouble – it’s horrifying! They continued to flee, jumped off the walls and ran like hell, leaving this damn stronghold. But, look at this! 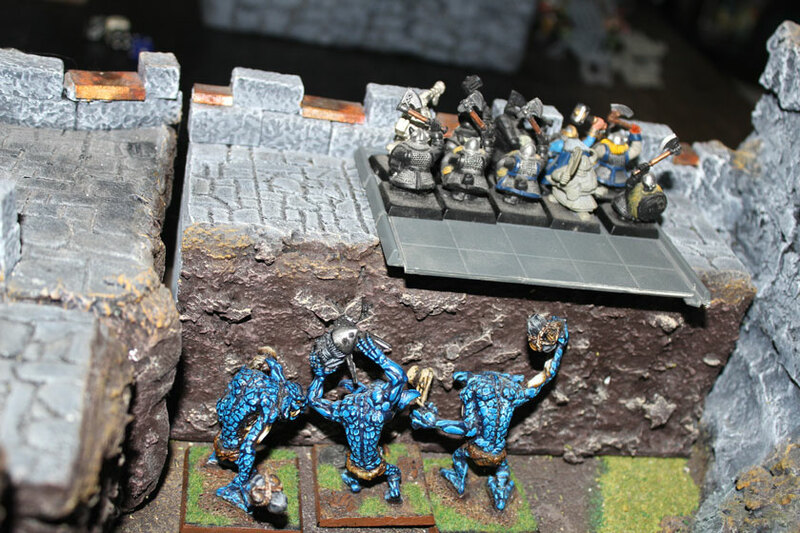 Trolls finally got useful – and charged at Dwarf Warriors! 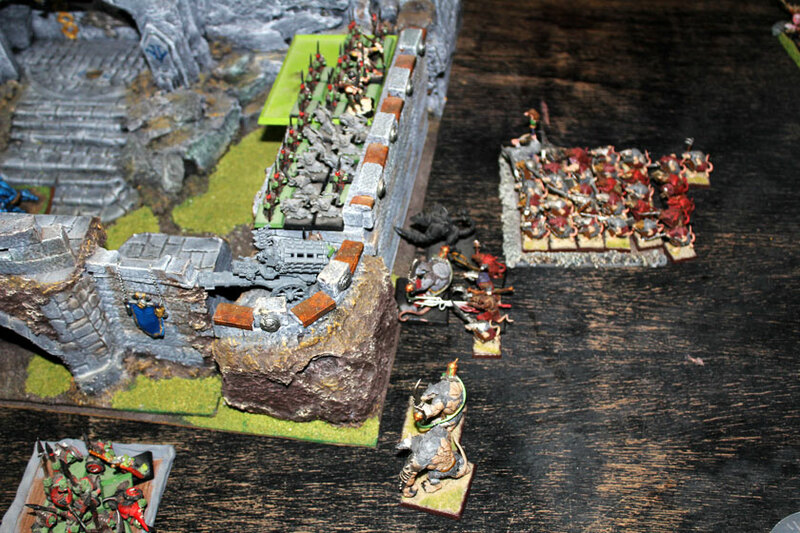 Two of them were killed during the charge but Dwarfs held the wall and inflicted few wounds on trolls. It was sufficient to break and overrun them. Such a glorious victory upon those horrible creatures! In this fight – Dwarfs were victorious. Trolls fled and got caught by Dwarf Warriors. In the same time – rock landed directly on the Flame Thrower, destroying it right away. That was Goblin Rock Lobber in action – sweet revenge on all burn Goblins. Take that! Last regiment of Goblin archers on the eastern walls after getting rid off the Skaven threat, turn their bows to the Dwarfs Warriors. One Dwarf die. Soon the future of the fortress will be clear. Last regiment of Goblins on the eastern walls were charged both by Dwarf Warriors and Longbeards with Thane Glurin Hammerhand. 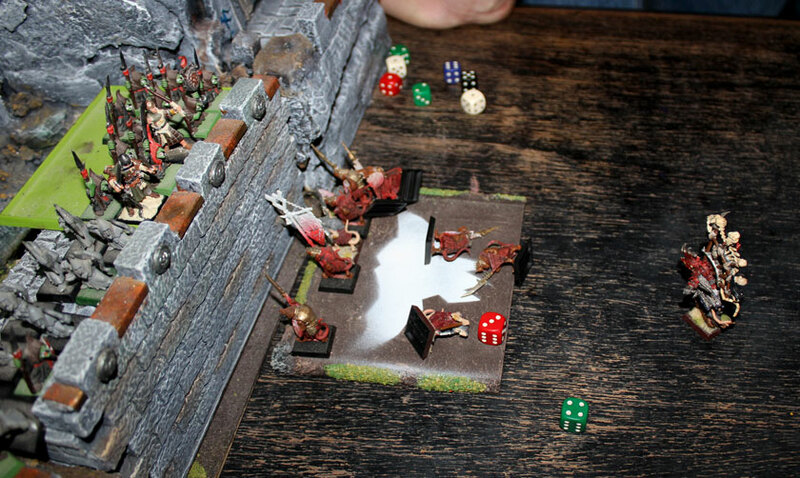 Longbeards and Dwarf Warriors charge last regiment of Goblins in the castle. Poor, weak Goblins were literally smashed by Dwarfs and their everlasting hatred – 5 Greenskins die, and they had no other option to flee. Triumphant Dwarfs held last segment of the walls. Victory! Victory – they have shouting. Dwarfs finally got rid off Goblins. The Castle was finally retaken! …but only 7 Dwarfs were lucky to survive the siege. Two remaining Spear Chukkas were about to get rid off soon. Dwarfs felt no threat from them at all. Surrounding mountains were swarmed with Goblins – those chased off the stronghold, but also other bands just waiting for opportunity to put their stinky hands on Dwarf treasures hidden in the keep. Don’t forget about strong urge of revenge spread upon survived Skavens. They for sure will share the word – and be back even stronger and numerous as never before. PS. I was planning to post this few days earlier, but I got stuck in Belize for some time with tons of activities (other than painting and writing). So, I’m sorry for slight delay. I should say it won’t happen again, but it probably will (there are too many distractions around!). Really great battle report; it’s nice to see an interesting story being played out across the table. It sounds like your luck was atrocious throughout. Losing the Grey Seer on your first turn was thematic but probably not much help for your game (and I wonder: why not just use Warpstone tokens that all Grey Seers start with if you’re really keen to increase magic power?). Great read, thanks for sharing. It sounds like your luck was terrible, but good on you for playing for the story rather than for the win!